World War II: a people's war? - Howard Zinn - Critical analysis of the idea that World War II was really a "people's war" against fascism, as opposed to just another inter-imperialist conflict with nothing to offer working people. How the Allied multinationals supplied Nazi Germany throughout World War II - Article on how, behind the patriotic propaganda encouraging the working class to slaughter each other, international big business quietly kept profits growing across all borders. World war as class war - James Heartfield - Article documenting the pitiless subordination of people to production on all sides of that crisis, and argues against the idea that the war tipped the scales in the favour of the working class. Unpatriotic History of the Second World War - James Heartfield - 'Sixty million people died in the Second World War ... a war between imperialist powers to decide which among them would rule over the world, a division of the spoils of empire'. The Fall of France: The Nazi Invasion of 1940 - Julian Jackson - Book showing the extent to which the French people were reluctant to fight after the horrors of World War I. Mental Maginot lines: Anti-republicanism, gender, and voting rights in the politics of the French Army, 1871-1940 - Andrew Orr - France’s generals, terrified of a repeat of the 1914-18 war with its mutinies and revolutions, imposed a highly defensive military strategy. The Hollow Years: France in the 1930s - Eugen Weber - "The common sight of wheelchairs, crutches, empty sleeves dangling loosely or tucked into a jacket, had left the French with their fill of combat." Nazism, Fascism and the Working Class - Tim Mason - Collection of essays showing how German imperialism and plunder was motivated by the need to contain the threat from the German working class. Social Policy in the Third Reich: The Working Class and the 'National Community', 1918-1939 - Tim Mason - Book analyising the attitudes and policies of the Nazi leadership towards the German working class, arguing that the regime did not securely integrate workers and this, coupled with the return industrial conflict in the 1930s may well have influenced Hitler's foreign policy in 1938-39. Hitler: A Biography - Ian Kershaw - Following Hitler's life from failed artist to dictator, Kershaw is more of a social historian than other biographers of Hitler, also addressing the unique nature of Nazi radicalism, the Holocaust, and the poisoned European world that allowed him to operate so effectively. Nazi Empire: German Colonialism and Imperialism from Bismarck to Hitler - Shelley Baranovski -Baranovski shows the extent to which the Nazi policies were a continuation of the barbarism of all European imperialism. The Taste of War: World War II and the Battle for Food - Lizzie Collingham - Collingham shows how food policy was a motivation, and a weapon, for all sides in the war, leading to starvation across Europe and Asia. 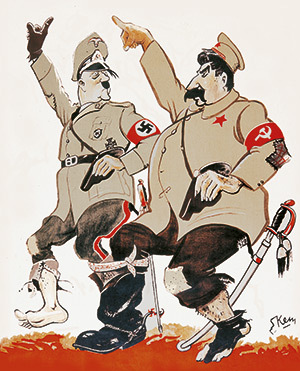 From Imperialism to Fascism; Why Hitler’s "India" was to be Russia - Emanuel Sarkisyanz -Sarkisyanz can be rather one-sided but he shows the surprising extent to which the Nazis were trying to emulate the British Empire. Wages of Destruction: The Making and Breaking of the Nazi Economy - Adam Tooze - Book arguing that social/economic approaches can explain Nazi social policy during the war. Architects of annihilation: Auschwitz and the logic of destruction - Gotz Aly1 - Examination of the frightening role of young educated careerists in building the Holocaust's ideological and material infrastructure. Final Solution: Nazi Population Policy and the Murder of the European Jews - Gotz Aly - Using Russian, German and Polish archives, Aly produces a detailed examination of the Nazis' 'final solution', finding explanations both in the ideological aspect of National Socialism as well as its practical application by Nazi bureaucracy. Anti-semitism and National Socialism - Moishe Postone. Text arguing that 'functional' explanations of the Holocaust are insufficient, and that the Holocaust was a deranged attempt to eradicate the ‘bad’ parts of capitalism, such as financial speculation, in order to preserve the ‘good’ parts such as ‘honest ’ wage labour. Hitler and the Jews: the Genesis of the Holocaust - Philippe Burrin - Book arguing that the genocide of Jewish people was down to a mixture of ideology and the 'practicalities' of Nazi social policy during WW2. Nazi Anti-Semitism: From Prejudice to the Holocaust - Philippe Burrin - Book discussing how, rather than being due to inherent anti-semitism in the German population, Nazi policy evolved gradually, pointing out the extent to which the Holocaust was a deranged attempt to avenge and prevent a repeat of the German defeat and revolution of 1918. National Socialist Extermination Policies: Contemporary German Perspectives and Controversies Ulrich Herbert - Book containing articles emphasising the sometimes ‘functional’ nature of the Holocaust for the German war effort. Armageddon: The Reality Behind the Distortions, Myths, Lies, and Illusions of World War II - Clive Ponting - Examination of World War II debunks many of the convenient myths that have grown up about the conflict, using irrefutable statistics and facts garnered from a wide variety of sources. Churchill - Clive Ponting - Book challenging the Churchill myth, declaring that much of the accepted interpretation of Churchill's life stems from his own writings about himself, and, using more recent source material, questions his competence as a war leader and his true level of popularity. The People as Enemy: The Leaders' Hidden Agenda in WWII - John Spritzler - Spritzler shows that Allied war aims were not democracy and self-determination, but were, as wars generally are, opportunities to suppress class rebellion. In Our Time: The Chamberlain-Hitler Collusion - Clement Leibovitz and Alvin Finkel - On the cynical collaboration between the UK government and the Nazis in the 1930s. A Higher Form Of Killing: The Secret History of Chemical and Biological Warfare - Robert Harris and Jeremy Paxman - Harris and Paxman's (yes, that Paxman!) classic account of how the US and the British planned to use poison gas and anthrax to exterminate vast numbers of German civilians. Winston Churchill and the "Second Front": A Reappraisal - Tuvia Ben-Moshe - This article shows how Churchill's war strategy was determined by British soldiers' reluctance to fight another bloody world war. Brute Force: Allied Strategy and Tactics in the Second World War - John Ellis - Ellis shows how the Allies won the war, not because of democratic principles or clever strategies, but simply because they could inflict more destruction on their enemies than their enemies could on them. Churchills's Secret War: The British Empire and the Ravaging of India During World War II - Madhusree Mukerjee - Mukerjee shows how Churchill was quite as indifferent to mass death in his Empire as Hitler and Stalin were in theirs. War Without Mercy: Race and Power in the Pacific War - John Dower - Dower writes of the atrocities committed by both sides in the Pacific War. The Meaning of the Second World War - Ernest Mandel - Classic Trotskyist account of the war. Crimes and Mercies: The Fate of German Civilians Under Allied Occupation 1944-1950 - James Bacque - Bacque’s estimates of the numbers of Germans that died due to Allied post-war policies are exaggerations. But the quotes and other facts he comes up with are very shocking. 1939-1945: Spanish Resistance in France - An account of the activity of Spanish anarchist and anti-fascist exiles in the Resistance in Nazi-occupied France. Tens of thousands were forced to flee Spain following fascist victory in the Civil War. 1943-1944: The CNT and the liberation of Paris - Information about the role that members of the Spanish anarchist trade union the CNT played in the liberation of Paris from Nazi occupation. Armed with a yellow mimosa: Women’s defence and assistance groups in Italy, 1943–45 - A journal article by Jomarie Alano on the history of the Gddd (I Gruppi di difesa della donna - 'Women's defence groups') in the Italian Resistance. 1943-1945: Anarchist partisans in the Italian Resistance - Historical notes on the activities of anarchist partisans in the anti-fascist Resistance in Italy during World War II. The Hajduks of Cotovschi - A short history of The Hajduks of Cotovschi, an anarchist communist partisan organization from Romania, that pursued its activity in Bucharest, between 1939 to 1941. 1939-1945: The Edelweiss Pirates - Article about the Edelweiss Pirates, a World War II era German anti-Nazi movement of working class youth who fought against the regime. 1940-1945: The Zazous - Article about the French anti-Nazi youth movement who opposed the Vichy regime in occupied France. Influenced by jazz and swing, they met in basement clubs and scuffled with fascists on the streets. The Workers' Opposition in Nazi Germany - Tim Mason - Tim Mason on resistance to the Nazis from the German working class. The World War II and post-war strike wave - Jeremy Brecher - Article on the huge, often unofficial, strikes which swept the US during and after World War II, despite the existence of union-enforced no strike deals. Wartime strikes: The struggle against the no-strike pledge in the UAW during World War II - Martin Glaberman - Martin Glaberman's examination of American car industry workers wildcat strike wave, despite their own union's no strike pledge, during World War 2. Class-conscious machinists: "Stormy petrels of west coast labor" - Richard P. Boyden - The story of San Francisco's Lodge 68 of the International Association of Machinists and Oakland's Local 1304 of the CIO's Steel Workers Organizing Committee, who went on strike repeatedly during the war, in defiance of the government, the FBI, the unions and the Communist Party. The struggle in the factory: history of a Royal Ordnance Factory - History of a Scottish factory during the Second World War, and the struggles they waged. 1942: General strike against military conscription in German-occupied Luxembourg - An account of the walk out in the central post office during the general strike in Luxembourg, 1942. Catch 22 - Joseph Heller - Novel by former World War II bomber Joseph Heller, a savage indictment of military madness and stupidity, and the desire of the ordinary man to survive it. It is a tale of the dangerously sane Captain Yossarian, who spends his time in Italy plotting to survive. Contains casual sexism throughout. Slaughterhouse-Five - Kurt Vonnegut - Darkly humorous novel recounting the story of an ill-prepared soldier and the grim reality of the Second World War. The Path to the Spiders' Nests - Italo Calvino - The story of a cobbler's apprentice in a town on the Ligurian coast, who steals a pistol from a Nazi sailor, and becomes involved in the Italian Resistance. Men and not men - Elio Vittorini - Story set in Milan in 1944 during the Italian Resistance, it tells the story of a partisan code-named "En 2" who organises an ambush against the fascists. Johnny the Partisan - Film about an English literature student who escapes into the mountains to join the Italian resistance to fascism. 1. Though his work on the Holocaust in invaluable in showing how it was functional for German capitalism, Aly's wider politics are quite problematic in that his tendency towards an 'anti-Deutsche'-influenced anti-nazism has, in recent years, caused him to support neo-liberal policies as anti-fascist acts. I should be prepared to do anything that would hit the enemy in a murderous place. I may certainly have to ask you to support me in using poison gas. We could drench the cities of the Ruhr and many other cities in Germany ..., and if we do it, let us do it one hundred per cent." Thanks for the warning about Gotz Aly. But he does provide interesting evidence that Nazi's plundered Europe to contain the German working class - an argument that could also be used to argue for an 'autonomist Marxist' account of the war. World War Two history is, of course, a minefield and few, if any, WW2 historians are against capitalist wars in the way many libcomers are. Indeed I suspect all the above authors would have supported the Allied war effort - hardly a libertarian communist approach! Moreover, any criticisms of Allied atrocities (e.g. Bacque, Lindquist, Harris, Mukerjee) are, of course, used by neo-Nazis to excuse Nazi atrocities. But that doesn't mean we should not use their historical research. But again thanks for the warning! Omer Bartov, The Holocaust Origins, Implementation, Aftermath, p92. I haven't read Donny Gluckstein's book, but he's a prominent SWP member (Cliff's son actually) and as such would presumably not be "uncritical of things like the Stalinist repression in the Greek resistance". As far as I know, the book argues that the second world was can be understood as a peoples war for democracy against fascism, as against the war between peoples. Obviously this has loads of problems but it might be worth including in a reading guide. You, You & You! The People out of Step with World War II - Pete Grafton - An oral history of the war, includes material from interviews with conscientious objectors and anarchist war resisters. people and the shocking savagery of the nazis. Truly harrowing. Studs Terkel's The Good War: An Oral History of World War Two. American people, soldiers and civilians, tell their story. bottom up account of the war. really interesting. Fussell was a combat soldier in WW2. Charles Glass Deserter: A Hidden History of the Second World War. A Generation (1955); Canal (1957); Ashes & Diamonds (1958). Each film deals with a short time sequence: the early underground resistance; remnants of the Home Army trying to escape through the Warsaw sewers; the war’s immediate tragic aftermath.